LivingTree transforms family engagement - includes every family with instant translation to 100+ languages and mobile access, saves time with SIS integration and simplicity, and brings your entire community into a single, secure network. 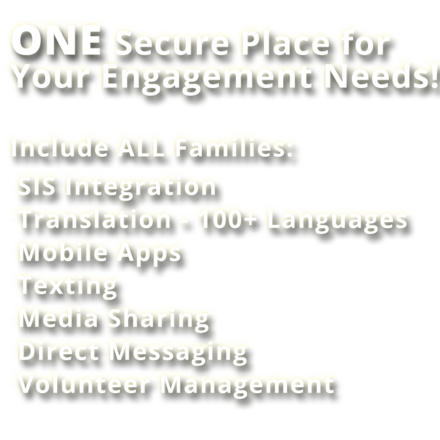 Every engagement feature you need, on web or mobile! Truly engage your community with two way conversation, texts, alerts, media sharing, and more. Include every member of your community with instant translation in both directions to over 100 languages. Share images, messages, locations, and more in a completely private and safe network. All features accessible via free mobile app including shared calendar and volunteer management. LivingTree builds trust and partnership between schools and families by providing private, social networks to enable family engagement. LivingTree builds these communities using the LivingTree Tiered Social NetworkR - a private social network that is built as a hierarchy, or ‘tiered’ like an organization chart or feeder pattern. Each group (class, grade level, etc.) has its own private community which nests into the organizational layer above it. Every administrator has full access and analytics for the smaller communities feeding into their own. Founded in 2012, LivingTree's mission is to connect the people who raise, develop, and educate our children. LivingTree aims to include every member of the community regardless of preferred language or socio-economic status. LivingTree's Tiered Social Network® empowers leaders, organizations, educators and parents to connect, share, and coordinate up, down and across all levels of their private network to help improve academic achievement. LivingTree has been recognized for this work by the Stevie® Awards for Women in Business as the 2016 Gold Community Involvement Program of the Year and 2016 Silver Smartphone App of the Year. © 2016 LivingTree. All Rights Reserved.